Preheat oven to 180C. Grease and line one 9 inch round cake pan and line the bottom of pan with parchment or wax paper. In a clean mixing bowl, with the whisk attachment beat the egg whites until foamy. Add the sugar and beat at medium-high speed until stiff peaks form. Add egg yolks and vanilla and orange essence and beat at low speed for 30 seconds until they are well combined. Then sift about one-third of the flour mixture over the egg mixture and gently fold in using a rubber spatula or whisk. Sift and fold in another third, and then fold in the rest. Pour into your pan, smoothing the top. Bake for about 25 minutes or until a toothpick inserted into the center comes out clean (cake starts to shrink from sides of pan). Cool on a metal rack before removing from pan. Place water in a small saucepan, along with the sugar, and heat until sugar has dissolved. Remove from heat, add 2 tablespoons orange juice and let it cool. Slice the fresh fruits into thin slices and put them into a bowl. Sprinkle 2 tbsp. of sugar over the sliced fruits and refrigerate. If you use powder whipped topping mix, then place 1 and 1/4 cup cold milk, 1 tsp vanilla essence with 3 packet powder in your mixing bowl. Then beat the mixture just until stiff peaks form (5 min). 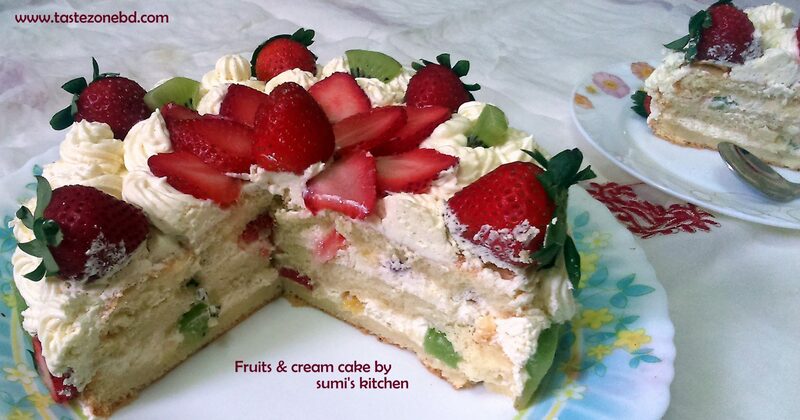 Mix fresh fruits with 2 cup whipped cream.. Reserve 1 cup of whipped cream. Brush the cake layer with syrup. 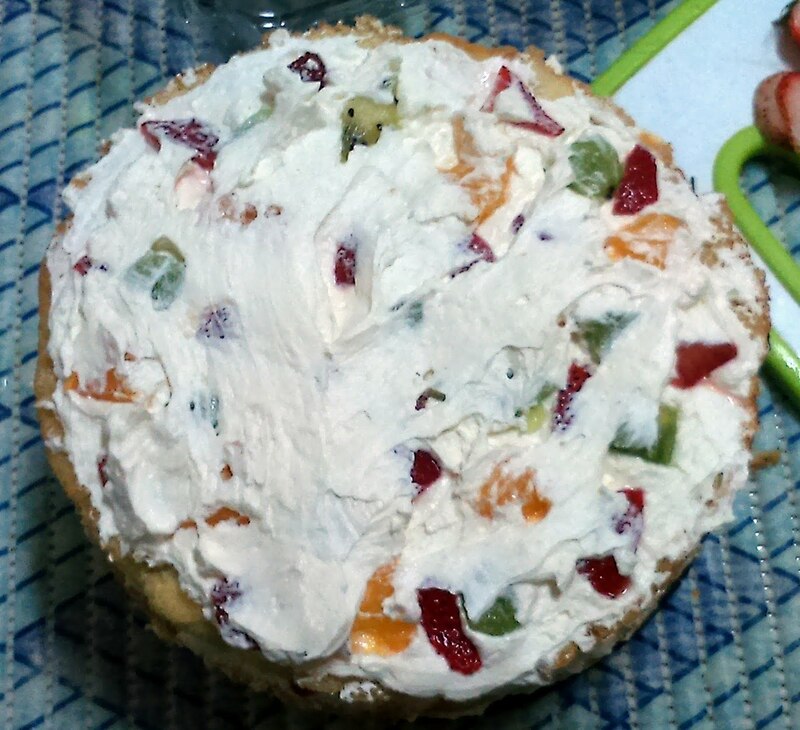 Take whipped cream and fruits mixer and spread on the moistened cake. Brush the cut-side of second cake layer with syrup. 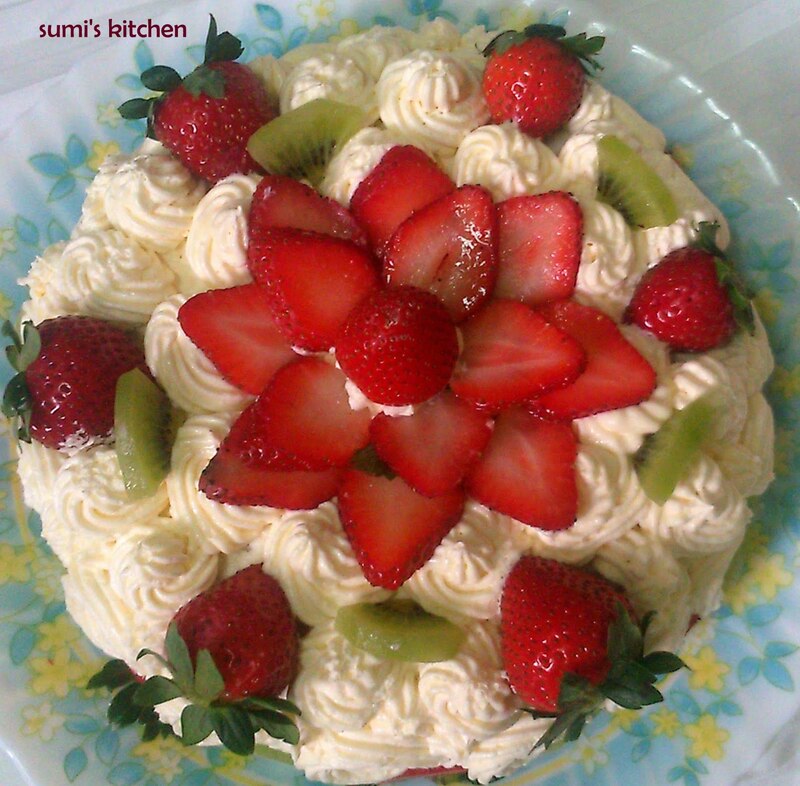 Spread whipped cream mixer on the moistened cake. Place cut-side down on top of the cream, gently pressing to compact and spread the reserved whipped cream over top and sides of cake. Place some reserved cream in a pastry bag fitted with a large star tip and pipe rosettes on top of cake. Cover and refrigerate the cake for several hours (or overnight) before serving.